Since I started working for The Daily Tea, I’m always on the lookout for cool new products that can make my tea habit even better, or easier, or just cooler. So when I heard about a brewer I can take on the road, I just had to share it with you. Yikes! That’s a lot of work, eh? But I love my mate so I do it every day. Seems though I can now shorten it and brew my mate—or any other loose tea—in the travel tea brewer, saving myself a ton of time. Really?! And wow, it also reduces the temperature to 140˚F after brewing so I can drink it right away. I love to travel, and have been to Argentina a dozen times over the past 10 years to dance tango and visit the family of my girlfriend, who is a native Argentinian. 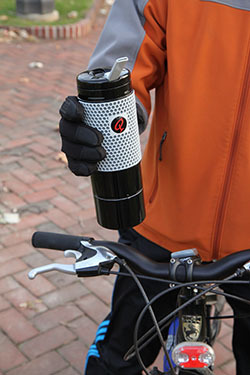 I was impressed by the Argentine passion for mate, but noticed drinking it away from home meant carrying multiple utensils and could lead to spills. So I invented an easier way. And what works for mate, works for loose-leaf tea too. Check out the Kickstarter program for Qterra NOVO Travel Tea Brewer. Hop on it! This program ends on January 3rd, 2015.